Click on the Voki Classroom tab and log in to your account. 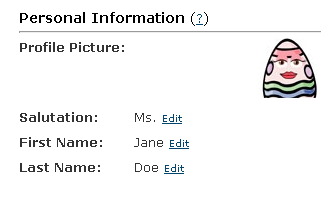 Your personal information is visible in the Student view and the Assignment Page. Under this section, you can change your salutation and your first and last name. You can even upload your own picture! The picture can be a picture of you or any pictures that represents your class. It can also be left blank. To change your personal information, click Edit, input your new information, and remember to click Save. Under personal settings, you can edit your email address and your password. The email address displayed under this section is the email address you use to log into your Voki and Voki Classroom account. Be sure to use a valid email address so that you can receive your account information! The password you chose will be used to into your Voki and Voki Classroom account. To change your email and your password, click Edit, input your new email/password, and remember to click Save. You will receive a notification informing you that your email address has been updated. Note: Do not give your password away to your students. Each student has his/her own login ID and password for Voki Classroom. Account setting is where you can find information about your Voki Classroom account. Here, you can find out when your account expires, what kind of payment method you have on file, enable or disable automatic billing, how many student accounts and classes you have, your account ID, how long you’ve been a valued Voki Classroom user and past invoices. If your Voki Classroom account is expiring, you can click on Extend. Then select the subscription you want and proceed with checkout. 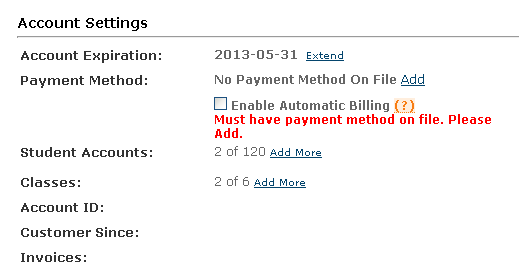 If you have a payment method on file, you can enable to disable automatic billing. By checking the automatic billing box, the payment method you have on file will automatically be charged when your Voki Classroom account is about to expire. Your Voki Classroom account will be extended by the same time period you selected at sign up. will then need to select the number of student accounts or class you wish to purchase. Don’t have a Voki Classroom account? Sign up now for our 15-Day Free Trial!